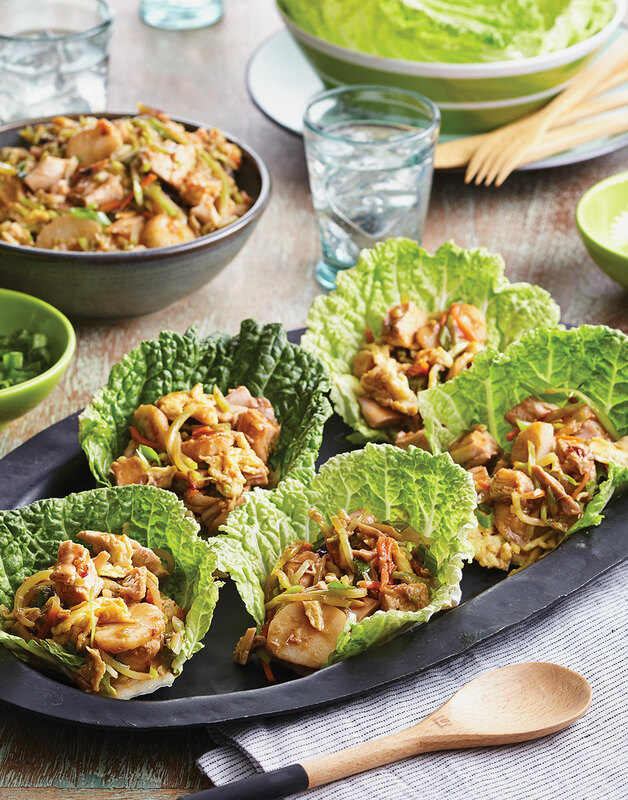 Mu Shu Turkey Cabbage Wraps are a great way to use up leftover turkey. Filled with stir-fried veggies and turkey, and wrapped in crisp Napa cabbage leaves, this Chinese dish will have you wanting more. Whisk together hoisin, soy sauce, sherry, chili garlic sauce, cornstarch, and sesame oil for the sauce. Heat 1 Tbsp. vegetable oil in a wok or large nonstick skillet over high until it shimmers. Stir-fry eggs just until cooked through; transfer to a plate and cut into bite-sized pieces. Heat remaining 1 Tbsp. vegetable oil in wok until it shimmers; add scallion whites, ginger, and garlic and stir-fry just until fragrant, about 30 seconds. Add slaw and water to wok; cook until slaw softens, about 5 minutes. Stir in turkey, water chestnuts, sauce, eggs, and scallion greens until coated and warmed through; serve in cabbage leaves.